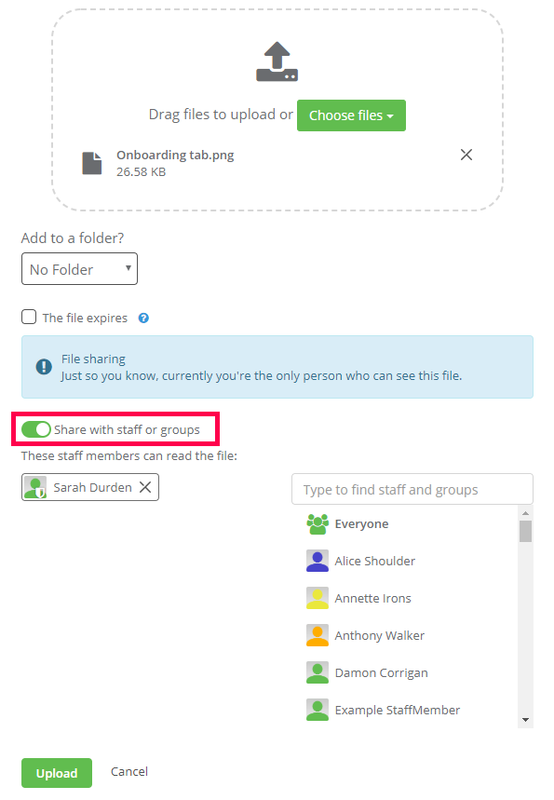 Admins are able to share files with their staff on the Files tab (from the menu on the left hand side). Firstly, click on Upload and then Choose files. 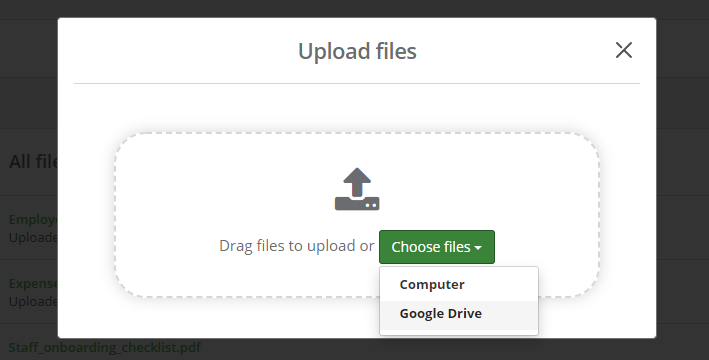 You can then choose either your Computer or Google Drive to select the file you wish to upload. 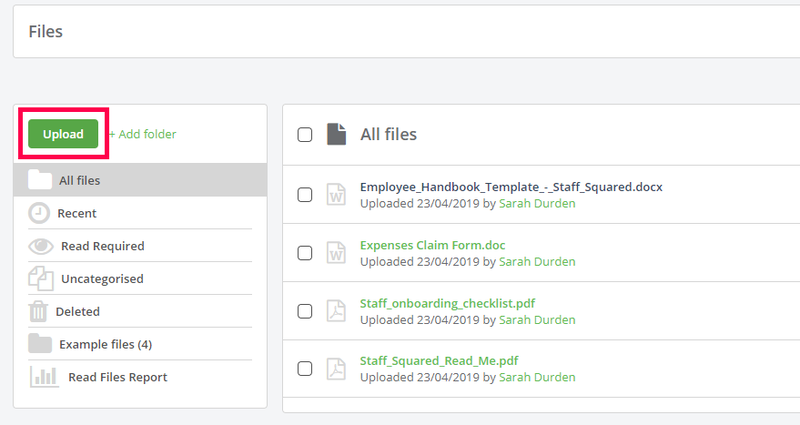 Locate the files you wish to upload and you will be given the option to add to a folder, set an expiry date, and select which staff members you want to give read access to by clicking on the toggle switch. You can set the frequency of your reminders here. Then click on Upload to save the settings. In order to ensure that staff read an important file, you can set a read request to notify staff and track responses. To do this, click on the cog icon on the right side of the file and select the Reads button from the drop down options. 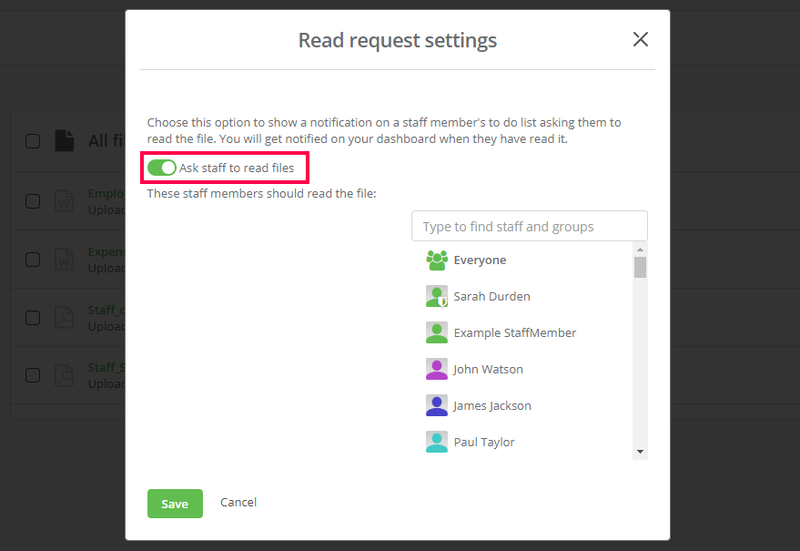 From the pop up window, you can select which staff members you want to send a read request to. Your document will then be added to your task list and it will notify you of how many of your staff members have read the document. 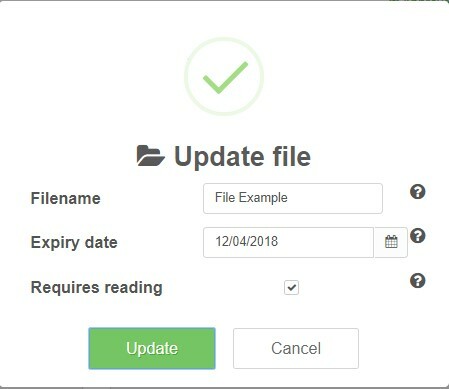 If you have set an expiry date for your files then you will get a notification when your file is about to expire to allow you to either update the file or remove the expiry date. If you click on Update file you will be given a new dialog box where you can amend the file details. If you want to delete the document altogether, just click on the cog next to the document you have added and click Delete from the drop down options. You can then confirm deletion and the file will be moved to the Deleted folder.